Earlier today it was announced that 14-time world champion Holly Holm will be retiring from the sport of boxing to dedicate her combat sports career full time to mixed martial arts. The announcement came earlier this afternoon at a media luncheon at the Albuquerque International Airport in Albuquerque, New Mexico. It also comes three weeks before her May 11th fight against Indiana’s Mary McGee. That contest will be Holm’s (32-2-3) last as a professional boxer. In 2011, Holm debuted in MMA a sport where she has dominated and won all three of her bouts by knockout. The most recent victory came this past February on a Bellator card in Rio Rancho, New Mexico. During her fight which wasn’t broadcasted on television but streamed online, Holm would trend worldwide on Twitter, something she has never done with boxing. UFC Light Heavyweight world champion Jon Jones, former UFC Interim Welterweight champion and fellow Albuquerquean Carlos Condit. It also includes a large crop of some of the best female MMA fighters in the world including UFC fighter Julie Kedzie and newly crowned Invicta FC Atomweight champion Michelle Waterson.Her 11-year boxing career will end with her 24th career title fight against McGee in her hometown of Albuquerque, New Mexico. The fight marks the 31st time she will fight in the city. Holm captured her first world title, the IBA Light Welterweight belt, in just her 11th fight against Terri Blair in 2004. She would go on to win and defend five different belts in the light welterweight, welterweight division and light middleweight division. Her career will be remembered for defeating legendary fighters Mia St. John, Christy Martin, Mary Jo Sanders and for avenging a brutal knockout loss by out boxing Anne Sophie Mathis in their rematch. It will also be scrutinized for being unable to come to terms for a fight with the current welterweight queen and widely considered the other pound for pound boxer in the world, Cecilia Braekhus. 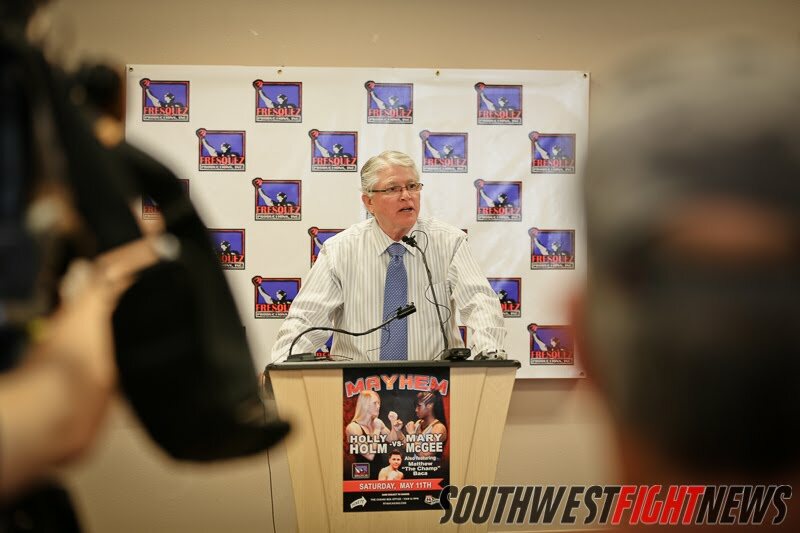 Just yesterday we reported that Holm would be inducted into the New Mexico Boxing Hall of Fame in June along with former world champions Bob Foster, Danny Romero, Johnny Tapia and current world champion Austin Trout.